Trees must reproduce or else they die. As all keen gardeners know, many trees have the ability to clone themselves. Transplant a "leaf cutting" and up pops a genetically identical plant without the need for sexual reproduction. In the wild, trees resort to cloning when there are no members of the same species nearby with which to sexually reproduce. It is a strategy that has helped them avoid extinction. In the new study, Dr Ally and her team studied populations of trembling aspen to investigate the effects of cloning on tree fertility. The aspen is particularly renowned for its ability to clone itself. Clones sprout from the roots and each is considered part of the same parent tree. The single largest aspen clone - named Pando meaning "I spread" - is believed to be 80,000 years old and weighs 6,000 tonnes, which if confirmed would make it the world's oldest and heaviest organism. Dr Ally's team found that genetic mutations gradually build up with each subsequent generation of clone, resulting in a decline in fertility. 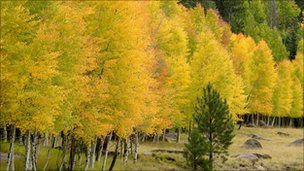 This means that the aspen cannot clone itself indefinitely, but eventually must reproduce sexually or die. Sorry bears-- a microphone isn't wood! !